Domaine Raymond Usseglio is a different estate than Domaine Pierre Usseglio, which is owned by his brother. Francis Usseglio moved to the Rhone from Italy in 1931. It took until 1948 before Francis Usseglio created his own winery. Francis Usseglio had two sons, Pierre Usseglio and Raymond Usseglio. Pierre Usseglio took over the family estate and Raymond Usseglio created his own winery using his name in 1964. As soon as Domaine Raymond Usseglio was created, the estate was bottling and selling their own wine, which was not a common practice in those days. Today, the current generation of the Usseglio family, headed by Stephane Usseglio continues to manage the domaine in the Southern Rhone Valley. Domaine Raymond Usseglio owns 18 hectares of vines in Chateauneuf du Pape. Three hectares of vines are used for grapes planted to produce Chateauneuf du Pape Blanc. The remaining 15 hectares are devoted to growing red, Chateauneuf du Pape varietals. Domaine Raymond Usseglio also owns 5 hectares in the Cotes du Rhone appellation and another 3 hectares of vines that are classified as IGP. All the vineyards in Chateauneuf are farmed using sustainable, biodynamic farming techniques. The best vintages of Domaine Raymond Usseglio are: 2018, 2017, 2016, 2015, 2012, 2010, 2009, 2007, 2006, 2005, 2001, 2000 and 1998. Domaine Raymond Usseglio produces 3 red Chateauneuf du Pape wines and 3 white Chateauneuf du Pape wines. Domaine Raymond Usseglio Chateauneuf du Pape – The blend varies, but it is often close to 75% Grenache, 15% Mourvedre, 5% Syrah, 3% Counoise and 2% Cinsault. The vines are in a myriad of different terroirs with rocks, stones, clay, sand and limestone soil. The vines are planted in l’Arnesque, Bois Senechaux, Cabrieres, Charbonnieres, Palestor, les Terres Blanches and the le Tresquoys, lieux-dits. The wine is aged in a combination of cement vats, foudres and a small amount French oak barrels for an average of 18 months. 3,500 cases are produced each year. Domaine Raymond Usseglio Cuvee Imperiale – 95% old vine Grenache and 5% other varieties. The Grenache vines are more than 100 years old. They were planted in 1902. The terroir is sand with some rocks and stones in the soil. The vines are planted in the Piallon, Grand Pierre and Girardette lieux-dits. The wine is vinified and then aged in cement vats for an average of 18 months prior to bottling. The production is on average only 250 cases per year. The wine was first produced in 1985. Domaine Raymond Usseglio La Part des Anges – 70% Mourvedre, 20% Grenache and 10% Syrah create the blend. The terroir is rocks and sandy soils. The vines are planted in the le Mourre de Gaud and les Terres Blanches vineyards. 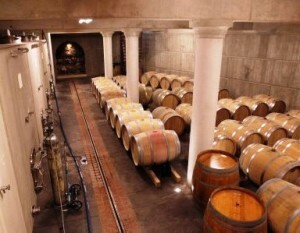 The wine is aged in an average of 80%, French oak barrels and in tank. The wine made its debut with the 2007 vintage. The production is quite small at close to 200 cases per vintage. Domaine Raymond Usseglio Chateauneuf du Pape Blanc – 40% Grenache Blanc, 30% Roussanne, 20% Clairette and 10% Bourboulenc. Close to 900 cases are are produced each year. Domaine Raymond Usseglio Reserve Roussanne – The 100% old vine Roussanne is vinified and aged in 100% new, French oak barrels. The vines are more than 40 years of age. The wine is not made in every vintage. And when it’s produced, not much is made as the average production is close to 90 cases. Domaine Raymond Usseglio Reserve Pure is made from 100% Roussanne as the name implies. Domaine Raymond Usseglio can be enjoyed on the young side with 1 hour or a bit more of decanting. This allows the wine to soften and open its perfume. Older vintages might need very little decanting, just enough to remove the sediment. Domaine Raymond Usseglio is usually better with 3-4 years of bottle age. Of course that can vary slightly, depending on the vintage. In the best vintages the wine should be consumed within 4-15 years after the vintage. Domaine Raymond Usseglio is best served at 15.5 degrees Celsius, 60 degrees Fahrenheit. The cool, almost cellar temperature gives the wine more freshness and lift. Domaine Raymond Usseglio is best served with all types of classic meat dishes, veal, pork, beef, lamb, duck, game, roast chicken, roasted, braised, stewed dishes, sausage, grilled meats, barbecue and cassoulet. Domaine Raymond Usseglio is also good with Asian dishes, hearty fish courses like tuna, mushrooms, cheese, pasta, eggplant and tomatoes. The white wine of Domaine Raymond Usseglio is best served with a myriad of different seafood dishes, shellfish, crab, lobster, sushi, sashimi, chicken, pork and veal, as well as Asian cuisine. Domaine Raymond Usseglio also produces wine from 5 hectares of vines they own in the Cotes du Rhone appellation. The wine was produced from 95% old vine Grenache and a field blend of assorted, allowable varietals, the wine is full bodied, concentrated, lushly textured and loaded with polished, fresh, ripe, sweet fruits with silky tannins. The luscious textures in finish really seal the deal. Dark in hue, which tips you off to the wines, dark, red fruit profile, the oak at the moment stands out. As it fades, you should find more spicy, dark red fruits, polished, tannins and length that does not want to quit. Produced from blending 70% Mourvedre, 20% Grenache and 10% Syrah, the wine requires cellaring before everything comes together. The spicy, pepper essence stands out in the nose. From there you find earth, thyme and a myriad of red fruits. On the palate, the wine is medium bodied, soft textured and fresh, with loads of sweet, juicy kirsch and a hint of olives in the last part of the end note. There is good length and purity here. The wine is made from mostly old vine Grenache, which is blended with assorted other, AOC allowable grape varieties. Medium bodied, fresh, bright, pretty style of wine, for early drinking. Still, you get a nice dose of black raspberries, kirsch, flowers, earth and black pepper. This will drink well young. Deep in color to match the depth of flavor, this rich, concentrated wine is packed with supple, ripe and super ripe black cherries. From a Mourvedre dominated blend, the remaining 30% is made from 20% Grenache and 10% Syrah. Peppery, dark red berries, kirsch and ripe, black and blue fruits on the palate deliver their luscious goods. The wine was produced from 90% Grenache and assorted other allowable grape varietals. Espresso bean and spice box blended with black and blue fruits lead to an intense, rich, fat, juicy modern styled wine with purity and length. There is good potential for this wine to improve. From a blend of 70% Mourvedre, 20% Grenache and 10% Syrah, the wine reached 14.5% alcohol. From a blend of 95% Grenache and the remainder coming from assorted field blend varietals, the wine kicks off with black raspberries, kirsch and licorice. Plush, round sweet, ripe, plummy fruits and minerality are found in the finish. Fresh, clean, focused and extremely concentrated with all the right stuff, made from 100 year old vines, this mostly Grenache based wine is filled with layers of fresh, ripe and over ripe, pure, sweet, luscious cherries that remain on your palate for close to 40 seconds! Filled with garrigue, spicy black raspberries, ripe, sweet and delicious. From 100 year old vines, this stunner serves up a delicious blast of fresh, sweet, ripe and over ripe black cherries, jam and garrigue. Full bodied, rich and plush, drink now for its young, vibrant qualities, or age it a few years for a softer experience. From a blend of 70% Mourvedre, 20% Grenache, and 10% Syrah, this modern styled Chateauneuf du Pape offers a meaty, spicy, dark fruit profile, with an earthy, black cherry and licorice character. The wine is already drinking well and should improve with a few years of age. Full bodied, structured to age, with a serious depth of flavor that is just now starting to show its essence. Here, you find, dark cherries, herbs, pepper, spice box and thyme on the nose. The palate continues that theme, with plums and kirsch in the finish.